Serial# : located in Settings --> About Phone --> Status. Scroll down to find your Serial #. 3. Wait, like everything else related to BB phones, of course Was told it will take 1-3 business days for them to provision the device on their network for this specific feature. Rep confirmed it's not a matter of IF they can, just WHEN they can do it, normally 24 hours from the reps previous experience. The information will be sent to the 'Special Device Management Team' - they deal exclusively with phones that are 3rd party or direct from the manufacturer and being utilized on the Verizon network. ****EDIT - UPDATE***** - Verizon says Advanced Calling is not available on the KEYone. Surf and talk on WiFi only. Not sure why I was told otherwise, but it seemed very positive at first. Smh...rolling eyes. Last edited by nrb1988; 06-17-17 at 04:02 PM. fire6, NovaCar, zephyr613 and 11 others like this. There's no reason they shouldn't be able to provision the device. If it has all of the correct bands, which it does, then its just stubbornness/laziness to not provision the device correctly. I'd be giving them the "I'm happy to take my business elsewhere" line if they don't get this fixed correctly for you. Good luck. Mine arrives Thursday, so hoping you have luck and get it working before then. Verizon: Thank you for contacting the Verizon Wireless Chat Team regarding your account. How can we help you today? You: I'm trying to get HD Voice activated on my BlackBerry KeyOne. The setting is in the phone but it can't be activated, it's just grayed out. Verizon: All representatives are currently assisting customers. You will be connected to the next available representative. Verizon: Thank you for your continued patience. The next available representative will be with you shortly. LEONARD: You have reached the right person to assist you with all of your verizon wireless questions and concerns! LEONARD: It would be my pleasure to assist you with setting up HD voice! LEONARD: May I ask to whom I have the pleasure of speaking with today? LEONARD: Thank you rickeylime! It is wonderful to chat with you today! You: Is that a setting that will be able to be changed? LEONARD: Yep, I see that it is a feature on your account so you shouldnt be having problems with it. Ill look into this for you! LEONARD: May I ask if you have tried to restart your phone and try it again? You: It started with no option under Advanced Calling, after a restart the HD Voice option is there, it's just grayed out and not able to be selected. You: I read online that the phone needs to be provisioned? LEONARD: May I ask where you went in your phone to find that option? LEONARD: Have you ever used the HD voice feature before? LEONARD: So I see on your account that your current blackberry was not originally a verizon device, so HD voice does not work on that device. You: I bought it straight from blackberry, and it's meant to be used on the Verizon network, since it has all the correct bands. But correct, it wasn't purchased through Verizon. You: Is provisioning the phone to enable Advance Calling an option? LEONARD: One moment please, let me look into that for you. LEONARD: No, provisioning is actually just taking the phone completely off of the account. Only verizon 4g lte smartphones can use the HD voice. And even then, some smartphones dont have that capability. You: Okay, thanks for your help and looking into it. LEONARD: You are very welcome! Is there anything else I can assist you with today? LEONARD: Have a wonderful night! LEONARD: Thank you for chatting with me today and being a valued Verizon customer. You can find answers to additional questions at vzw.com/support. Please click on the "X" or "End Chat" button to end this chat. Last edited by rickeylime; 06-12-17 at 09:38 PM. Just called and no luck for me either. They did say they were talking about carrying BlackBerry phones in the future though...which doesn't help me at all in this situation. I guess if a person doesn't care about those features it'll work fine as long as you have a good signal. 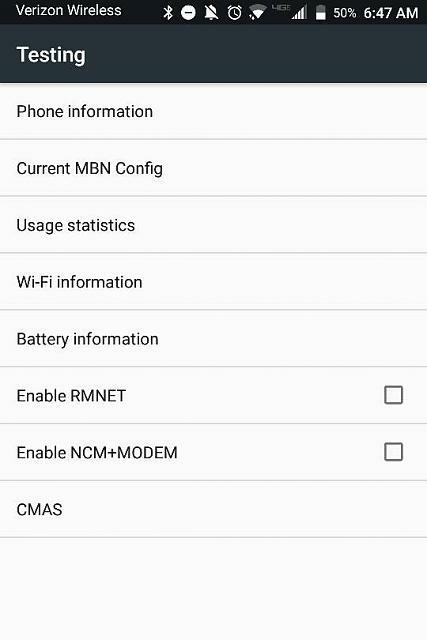 I haven't experienced any of that on the KEYone except for the no WiFi calling and Advanced Calling. Everything else has been working flawlessly. I think the Advanced calling will be able to be activated at some point. 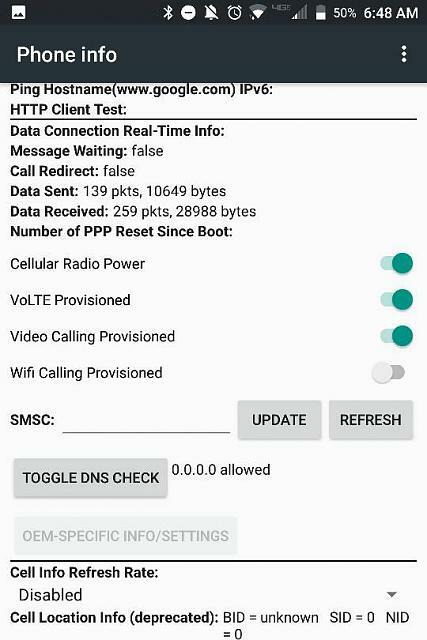 has anyone tried dialer code *#*#46368676#*#* to see if VOLTE Provisioned and WIFI provisioned can be ticked or already ticked? The dialer code may be different on the CDMA version I will try tonight. I believe at some point they will activate it. It took several months for them to activate it on the Priv. I will be traveling again in Sept and staying at a friend's house in Minnesota. They have virtually no signal at their house and I can only make calls over WiFi. As of now, my Priv will work for WiFi calls as well as my iPhone. So, I'll more than likely wait until Verizon gets this feature added before I pull the trigger on it. Too many instances where I find myself needing calling and data at the same time. Correct me if I'm wrong, but I don't think HD Advanced Calling is required on vzw to surf and talk. I'm on vzw with a BlackBerry Classic which does not have HD advanced calling, but I can surf and talk. Doesn't HD advanced calling on vzw just provide better call quality? And you aren't calling and surfing with wifi available right? You are doing this solely on the Verizon network? Can you post the codes you used? I looked for the thread but couldn't find under the name you gave. tnewton3, BigBadWulf, bluesqueen23 and 1 others like this. BigBadWulf, bluesqueen23, jafobabe and 4 others like this. ummie4 and jafobabe like this. I did have wifi on when I checked last time, so I did it again with only vzw connection. I was still able to talk and browse web sites on my Classic. You can get HD calling but not WiFi calling right now. kadakn01 and zephyr613 like this.